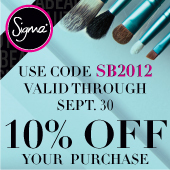 The discount code SB2012 will be valid for 10% off your entire purchase throughout September! Before uploading one of the banners below, make sure to check out our recent blog post about Coupon Marketing. This must-read will teach you how to use coupon codes to your advantage! Sharing the 10% off discount codes with your followers is a great strategy! Great promotion again Sigma! ^-^ Shared it with my readers already! I figured it out. will definitely be sharing this amazing deal with my readers! great! but what is the giveaway for the month of September, if they spent $30 or above? What is going to be for september free gift? The E05 brush has been extended as the free gift for September until further notice! I added this to my blog as well. Thanks for sharing. Thanks for the new coupon code! These banners look so great! Thank you, glad you like the new banners! Also, does the code for $10 off the Paris Palette still apply? Quero saber se tenho que fazer algum cadastro ou só colocar o banner no meu blog? Hi Kenia! 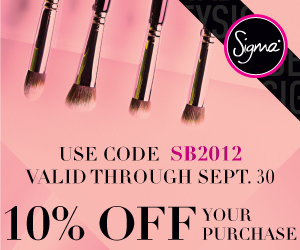 If you are not yet an affiliate, you can submit an application here: https://www.sigmabeauty.com/Articles.asp?ID=253. Once your application is approved, you can start using all of the marketing materials that we provide on the blog! Hi Hina! This code is meant for affiliates to share with their followers. However, anyone can use this code to purchase. Thank you! finally a new post for my blog!!!! Can you only become an affiliate if you live in the U.S? Hi Jenelle! The Sigma Affiliate Program is open to international clients!